Congratulations - You have reached 14mm and obviously you don´t have any problems with stretching your earlobe. 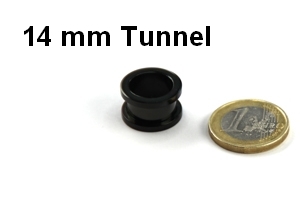 A lot of people don´t even reach this size but especially boys prefer larger tunnel sizes like 14mm tunnels and plugs and therefore have a lot of endurance with stretching their earlobes. The bigger the tunnel size the better will the the pictures and photos look on your plugs and tunnels especially with our custom plugs. Jewelled flesh tunnels and plugs will also look better in 14mm than in smaller tunnel sizes because there can be more space between the crystals which will make the overall appearance of the tunnels more aesthetic.